Despite the similarity of the name to the famous movie star, James Deane is actually a talented singer-songwriter from the UK. Blending country, folk, rock and other influences he's produced a great album. Listening to the album, you can hear the Neil YOung influences, and the opening track, Diamonds & Hearts has a Tom Petty feel to it. "Unwritten song" has a more soulful sound, and is another excellent song. "Strange emotion" is a slow beautiful song to end the album. The album is based on some great well-written songs with intelligent thoughtful lyrics, and these are played in a way that sounds deceptively simple, but which contains more depth than you first appreciate. The attention is focussed on the guitar and James Deane's great voice, with the bass, piano, drums etc playing a supporting role to fill out the sound without really intruding and diverting attention away from the key elements. This is a great album that is very listenable. I've had it playing quite a lot while I've been working over the last week or two and it still sounds fresh and shows no sign of getting boring. A great album that is well worth a listen. 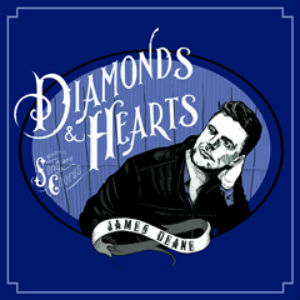 Diamonds & Hearts is out on 16th January 2012 on Denzil records.